Alison Thewliss, MP for Glasgow Central, has shown her support for a new campaign targeted at supporting those struggling financially. The #BenefitsAware campaign, launched by national charity Turn2us, aims to raise awareness of unclaimed support that those in financial hardship may be unaware of. New research by the charity found that half (50%) of low income households in Scotland are not claiming the welfare benefits and tax credits they could be entitled to. This is despite the fact that a huge 86% of this group have seen no improvement to their financial situation over the last year. Nearly three-fifths (58%) of those in Scotland who aren’t receiving this support said they had been deterred from checking or claiming potential benefits entitlements because they did not think they would be eligible. In addition, over one in ten (11%) said they were unsure of how or where to find out about this help. As a result, over three-quarters (77%) have not checked what welfare benefits they could be entitled to within the last year. Furthermore, over two-thirds (67%) would not consider checking their benefits entitlements if their income dropped, and only 2% would turn to a charity for help. Yet nearly two-fifths (37%) said they would cut back on gas, electricity and other essentials, and over a quarter (28%) would resort to cutting back on food. “Anyone can find themselves struggling financially and it’s really important that those needing help know where to turn. 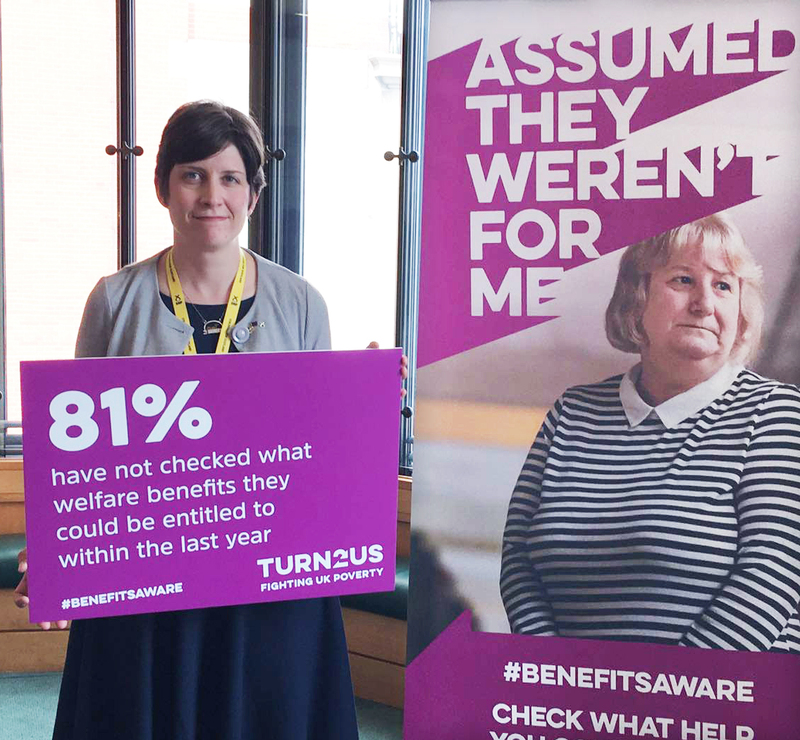 The benefits system can be a bit daunting, especially if you’ve never claimed before, which is why the Turn2us #BenefitsAware campaign is so important. Turn2us is urging anyone in need to use its free and confidential Benefits Calculator at Turn2us.org.uk to see what they could be entitled to and how to make a claim. The website also features information on benefits and other help for a range of different circumstances.